The recent Mark Knopfler & Bob Dylan tour ended with the show at the Hammersmith Apollo in London on November 21, 2011. The last encore played that day was a duet of both masters – the song ‘Forever Young’ (from Dylan’s 1974 album Planet Waves). A new guitar appeared on this song – a Mark Knopfler Signature Strat with lipstick pickups. The lipstick pickup was the pickup on vintage Danelectro and many Silvertone guitars – like the one that Mark plays on Donegan’s Gone. 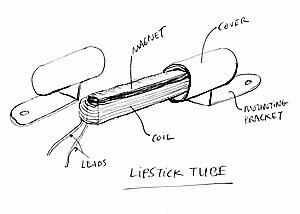 It is called lipstick pickup because those silver tubes that house the coil look like a lipstick – in fact they originally were surplus lipstick tubes! 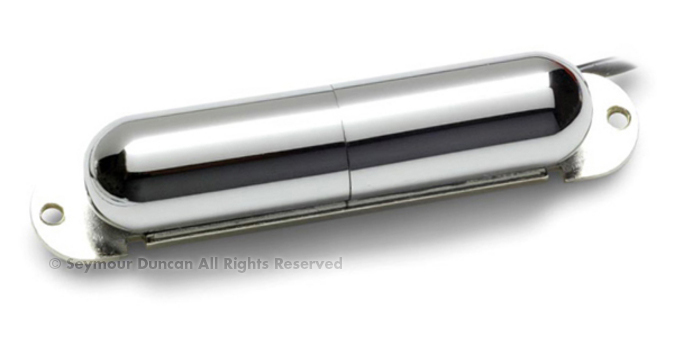 Inside, a lipstick pickup does not have individual pole pieces like a standard Stratocaster pickup but one alnico 6 bar magnet instead, and the coil is simply wound around the bar (see picture). The sound of the lipstick pickup is rather different than the stock Stratocaster pickup. Generally pickups without single pole pieces have a less dominant resonance peak (more information on the resonance peak in this blog post) and thus softer treble end, plus the metall lipstick tube dampens that resonance peak even more (like the cover on a Telecaster neck pickup does). 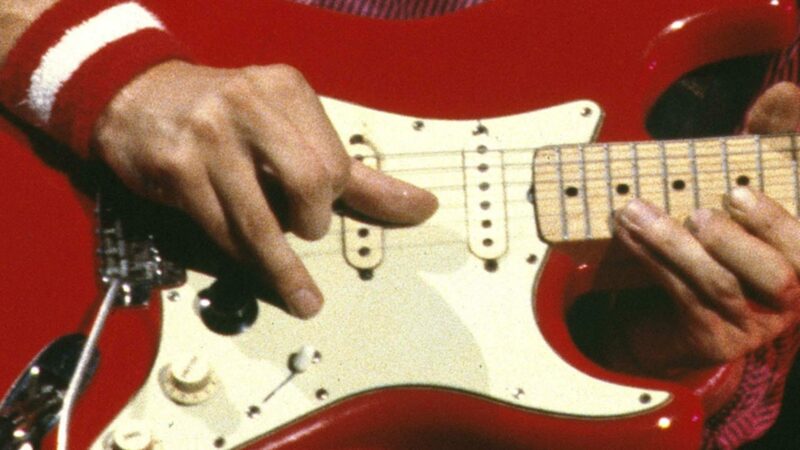 The sound can for this reason be described with warm, jangly, silky, transparent, but less harsh than a normal Strat, less bite, less high end. In Danelectro and Slivertone guitars both lipstick pickups were normally wired in series instead of the parallel. This also causes a drastic sound change. Mark Knopfler was probably enthused for these pickups by Mike Henderson, who was Mark’s third guitarist on the 2001 tour. Mike favours Danelectro guitars for slide. The original lipstick pickup is too long to fit into a Stratocaster pickguard but many manufacturers offer replacements that fit into the Stratocaster. In fact the pickups in Mark’s guitar are Seymour Duncans SLS-1. As his guitar does not look modified otherwise (normal 5-way switch) the pickups are probably wired in parallel, like in a standard Stratocaster. Mark played the 2&3 position (neck and middle) on Forever Young. 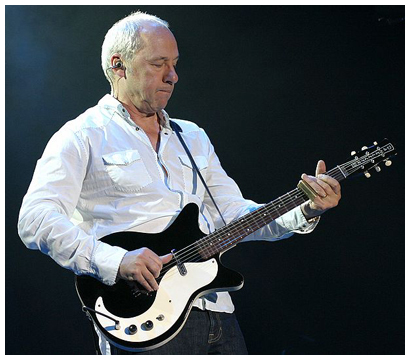 Update: Simon was so nice to let us know through his comment that there is video on the official Seymour Duncan channel that shows Seymour Duncan himself with the loaded pickguard he made for Mark Knopfler. One detail he mentions is that it is a RWRP pickup (reverse wound/reverse polarity) in the middle position to cancel hum. So nice to watch this performance again! Thank you for your comments. Simon, I updated the article to embed that video by Seymour Duncan.